Sodium lights on paper are known to offer up to 150 lumens per watt of light, but the same number of lumens from an orange light source compared to the same number of lumens from a full spectrum light source such as plasma lights obviously don't mean the same thing. There are three types of light, photopic, mesopic and scotopic. Photopic lumens are what is usually posted in lamp catalogs and only practical for characterizing well lit, or day-time illumination. 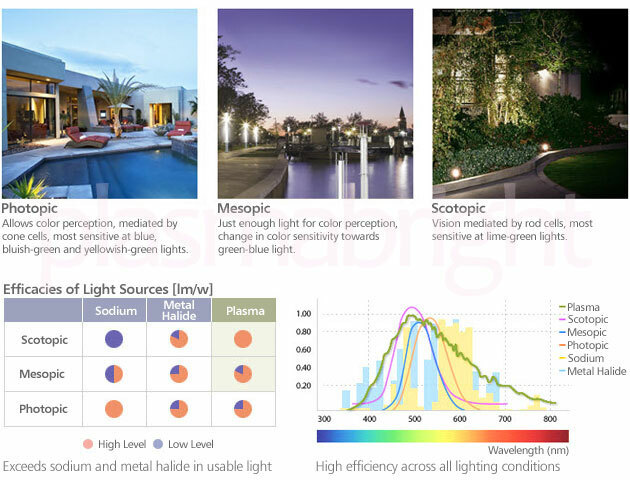 As a result, mesopic and scotopic luminous efficiency systems were created to better calculate proper night-time illumination. When adjusted to the scotopic vision, sodium lights actually have a reduction in efficiency, down to less than 75 lumens per watt. The lack of color differentiation also delays our reaction times to motion. Cities around the world use poor quality sodium lights to illuminate their streets, but it ruins colors and makes for an unsafe driving experience. Plasma lights can remedy that and more. Night-time sporting potential will be maximized with better color rendition and motion detection. Colors will be vibrant and certainly add to property values. All that while saving energy, what more can you ask for in a light source?